I’ve set up Flickr so that from time to time I can email camera phone pictures directly into blog entries here. Kinda cool. 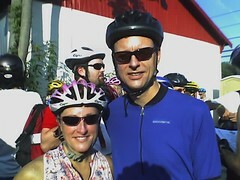 Here’s one of me and Kem – in biking garb of course. This one was actually taken at Urban Assault.